We've already had little nuggets of announcements such as track layouts and the presence of a Formula E HQ at Donington, but the announcement of Mahindra's driver line up is particularly exciting. 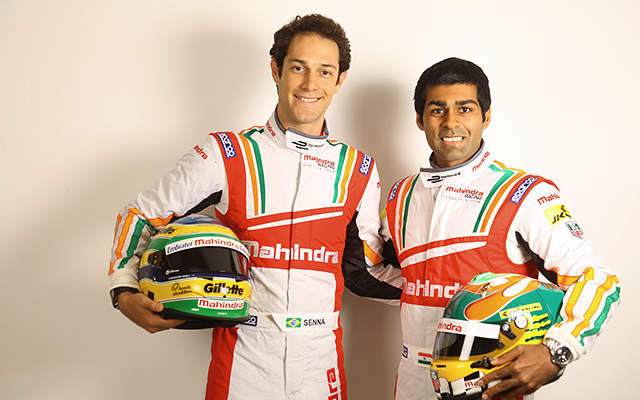 Today the team confirmed that their line up for the first ever Formula E season will be the ever likeable duo of Karun Chandhok and Bruno Senna. As a big fan of both drivers, I'm really looking forward to seeing the HRT reunion party doing awesome things in the world of electric this September onwards. Where to even start on these two? Whilst neither have had the opportunity to really guide themselves into huge success in F1, it'd be hard to have any disrepute towards their experience and knowledge. Both are incredible likeable drivers and have proved themselves to have a great deal of understanding, Karun particularly being a walking Wikipedia. Despite their HRT's being awfully slow and vastly unimpressive, it didn't stop the likes of Karun sticking around in the sport as a respected personality and being a fabulous ambassador for Indian motorsport so it only makes sense that he'd be racing for Formula E's Indian team. 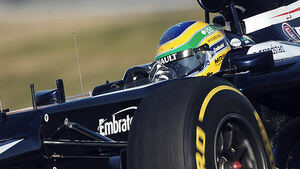 And then there's Bruno Senna, the man who could never match up to his uncle's namesake career but has done a good job to build his own reputation away from the Senna name. He and Karun no doubt had tough times at HRT struggling with that car but the pair have obviously built up a strong rapport over the years. Bruno moved on to drives at Williams and Lotus too during his F1 career. Plus he had a lovely chat with me at Goodwood and gave me a big hug so he's basically the best driver, obviously. The really excellent thing about all of this is the fact that this duo come in to the sport with the already confirmed Lucas DiGrassi, Daniel Abt, Sam Bird and Jaime Alguersauri. These six drivers all come with a vast wealth of motorsport pedigree in various different ways and it really gives the Formula E lineup a great deal of credibility even with another 14 drivers to be confirmed over the weeks to come. It's particularly exciting to see drivers who probably deserved more in F1 get a new, big chance to show themselves in a clean slate with no one having any experience in this new formula. At this moment no one knows how well they or anyone else will do in Formula E but this announcement brings a team in Mahindra that have a fantastic friendship and experience that'll no doubt help them out. Formula E offers a unique new twist on the familiar way of racing we all know and love and having familiar names like Chandhok and Senna join the ranks can only be great news for the sport. As the weeks go by I'm getting more and more excited for seeing not only how the teams are shaping up but how the tracks are looking and how everything continues to build up until September 13th. And on a small side note - If you want to know more about Formula E, I advise following the likes of Current E and EVSportsNews on Twitter as they've been excellent for updates on the Formula E universe already!